The research team examined a theory previously published in the journal Nature which claimed that modified Newtonian dynamics (MOND) couldn't be true because the internal motions were too slow within dwarf galaxy NGC1052-DF2, a small galaxy comprising about 200 million stars. Lead author Pavel Kroupa, Professor at the University of Bonn and Charles University in Prague, said: "There have been many premature claims on the death of MOND in very influential journals. So far, none stand up to detailed scrutiny." 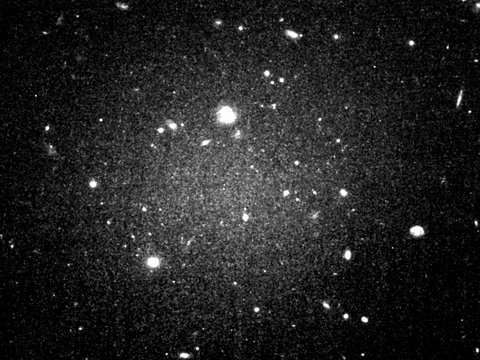 The second is MOND, which explains a vast wealth of data on galactic rotation speeds using only their visible stars and gas. MOND does this with a mathematical prescription that strengthens the visible material's gravity, but only where this gets very weak. Otherwise, gravity would follow the conventional Newton's law, e.g., in the solar system – or close to a massive galaxy. Dr. Indranil Banik of the School of Physics and Astronomy at the University of St Andrews, and soon to be of Bonn University, said: "It is remarkable that MOND still makes such successful predictions based on equations written down 35 years ago." Dr. Hongsheng Zhao, of the School of Physics and Astronomy at the University of St Andrews, said: "Our modeling of the MOND environmental effect was later confirmed by another group." Hosein Haghi, Professor of Physics at the Institute for Advanced Studies in Basic Sciences, in Iran, said: "This effect has been known for a long time. These Nature authors were unaware of our papers on how to include it."